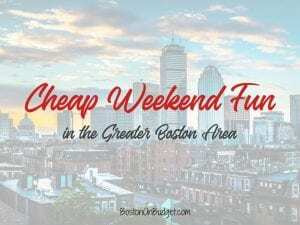 Cheap Weekend Fun in Boston for March 23-24, 2019! Happy (almost) weekend! There’s not a whole bunch of free and inexpensive events happening this weekend that I could find, but Sunday is going to be SO nice out! So a great chance to go outside, go for a long walk, and just enjoy the nice weather! Maple Sugar Festival Days: March 23-24, 2019 at Brookwood Farm in Canton. Head to this farm located in the DCR Blue Hills Reservation to learn how Maple Syrup is made! $10 for adults, $5 for kids, under 2 are free. Admission to the event also includes admission to the Blue Hills Trailside Museum for a same day visit. Maker Supply Market: Sunday, March 24, 2019 in Somerville. Head to Bow Market on Sunday to shop all your favorite makers leftover supplies and discontinued supplies at a discount!